Walter Hart’s father died soon after Walter was born. Sometime later, he and his mother, Mary Hart, were taken in by a Cincinnati Patrolman, Frank H. Menkhaus, at 1724 Denham. When Walter came of age, he joined the Cincinnati Police Division and moved next door with his new wife, Lillian Hart, to 1720 Denham. By 1935, after only five years in the Police Division, Walter was promoted to Detective. For the next 21 years, he was assigned to the Homicide Squad. He and his partner, Detective Thomas Faragher, boasted to have handled “about 1000 murders” and recorded a 90% clearance rate – astounding even if slighty exaggerated. Among his many cases, he was a principle investigator in the Anna Marie Hahn case. Detective Hart was injured in an auto accident about 1953 and two years later, on orders of Police Surgeon M. C. Menard. M.D., he requested a transfer out of Homicide to general investigations. Later that year, on September 19, 1955, on his way home from work, Detective Hart stopped in the Grey Eagle Café at 201 W. 6th Street in District 2 His wife and he were friends with the owners. He was still there and talking with one of them, Mrs. Gertrude Becraft, at 11:50 p.m.
Lemuel Trotter (28) of Shubuta, Mississippi and Robert Lee Jackson (40) and Willie Barnett (24), both of Cincinnati, met in Alabama’s Kilby Prison where they were incarcerated for various offenses. On September 19, 1955, all three were in Cincinnati and planned to rob the Grey Eagle Café and its customers. At 11:50 p.m., Trotter, carrying a Smith & Wesson .38 caliber revolver, and Barnett, carrying a .32 caliber semiautomatic pistol, both firearms supplied by Jackson, went inside the café. Jackson waited outside as a lookout. After announcing the robbery, Trotter and Barnett herded the customers into a restroom. Detective Hart went into the restroom as if he were just a customer. Once all were relatively safe inside, Detective Hart prepared to leave the restroom to face the robbers. Mrs. Becraft warned, “Don’t go out Walter! You’ll get shot.” Detective Hart explained, “I’ve got to. I’m a cop.” He flung open the restroom door and walked out with his Colt Police Positive .38 caliber revolver. He saw Barnett first, rifling through the cash register, and shot him. He did not see Trotter who had moved and was now to the right and behind Detective Hart. Trotter shot him in the back and through the heart. Detective Hart spun and returned fire, but without taking effect. The robbers fled the café. Detective Hart got up, staggered to the telephone, tried calling for help, collapsed, and died. Detective Hart was survived by his wife, Lillian Hart, and two children, Patricia Hart (25) and Thomas Hart (23). Detective Faragher, his longtime partner and friend of the Hart family, notified them of his death. Sadly, the topic of his conversation with Mrs. Becraft that was interrupted by the killers was Patricia’s upcoming wedding. Detective Hart is buried in St. Mary’s Cemetery in St. Bernard. Patrolmen George Rees, Highway Safety Bureau, and Wilson Day, District 2, heard the shots, responded to the café, and found Detective Hart. They had him rushed to Cincinnati General Hospital, but he was pronounced dead on arrival by Dr. Goettle at 12:36 a.m.
After tending to Detective Hart’s remains, Patrolmen Rees and Day canvassed the area and found and apprehended the wounded Barnett, of 507 Carlisle Avenue, in a hallway at 229 West 6th Street; 1½ blocks from the bar. Detectives Marvin Friedman and John Ritter responded and recovered at that address personal papers and money belonging to victims robbed in the café. He gave police Jackson’s name as an accomplice. Jackson fled the scene to his home, four blocks west, to 623 W. 6th Street. By the time officers arrived there, he had changed clothes and caught a cab. Patrolmen William Breckel and William Hayes, District One, conducted stops of vehicles going over the Chesapeake and Ohio Railroad (Clay Wade Bailey) Bridge. They stopped the cab Jackson had caught, identified him as a suspect, and arrested him. Patrolman Harry Batters, Vice Squad, Patrolman Lehman Foster, District Four, and Detectives John Greene, Eugene Moore and Donald F. Roney, Crime Bureau, recovered the murder weapon and Detective Hart’s wallet in Jackson’s apartment. Jackson bragged at Detective Headquarters that no one saw him give the guns to the other two and no one saw him standing watch outside the bar. He was confident of his defense. Trotter fled the café through a side door and down an alley. He caught a cab and went to 1543 Baymiller Street and changed clothes. Within a day and after more than 100 people were questioned, it became clear to detectives and patrolmen, many of whom were working off duty and around the clock, who the trigger man was, where he had been during the last two weeks, and where he went immediately after the robbery. Detective Chief Henry Sandman ordered a manhunt for Trotter. By then, Trotter had gone to Newport, Kentucky, jumped onto a freight train, and traveled to Mobile, Alabama. Barnett was charged with 1st Degree Murder. He claimed insanity and was declared incompetent to stand trial and was removed to the Lima State Hospital for the criminally insane. During 1972 and after Ohio’s death penalty was abolished, doctors at Lima State Hospital suddenly determined Barnett to be capable of standing trial. A ruling was forthcoming in December 1972. We do not know what that ruling was, but he died in the Lima State Hospital. Trotter, using the name Reco Glover, was apprehended almost 17 months after the murder on February 8, 1957, in Selma, Alabama. Lieutenant Charles Martin, Crime Bureau, interviewed Trotter and extradited him to Cincinnati and charged him with 1st Degree Murder. He tried to defend himself saying, “When you’re guilty, you don’t need a lawyer,” but the judge appointed him an attorney. He was found guilty of 1st Degree Murder with a recommendation for no mercy. Appeals were filed in his behalf and the last was denied by the U.S. Supreme Court. He found religion in prison, ordered roast duck and deserts as a last meal, and was executed July 7, 1958, at 7:59 p.m., almost three years after the murder. He is buried in Potter’s field on the grounds of the old State Hospital in Columbus. Jackson was also found guilty of 1st Degree Murder with a recommendation of no mercy. He ordered no last meal, looked upon the preacher praying for him with disdain, and was executed on the same date at 8:15 p.m. He is also buried in Potter’s field on the grounds of the old State Hospital in Columbus. Two bronze busts of Detective Hart were sculpted by Patrolman Elmer Robisch. One is still displayed at the Thomas Hart’s Hart Pharmacy at 4861 Glenway Avenue. The other is on display on the Memorial Wall of the Greater Cincinnati Police Museum. Frank H. Menkhaus, who took in Walter Hart and his mother, had a son, Edward B. Menkhaus; who had a son, Herbert B. Menkhaus. Herb Menkhaus had a son named Michael Menkhaus. Mike Menkhaus, not knowing that his great grandfather, Frank Menkhaus, took in Thomas Hart’s grandmother and father, took up pharmacy and interned under Thomas Hart at Hart Pharmacy. If you have information, artifacts, archives, or images regarding this officer or incident, please contact the Greater Cincinnati incinnati Police Museum at memorial@police-museum.org. 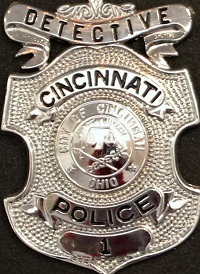 © This narrative was revised on September 10, 2012, by Cincinnati Police Lieutenant Stephen R. Kramer (Retired), Greater Cincinnati Police Historical Society President, with extensive research conducted by Cincinnati Police Dispatcher Karen R. Arbogast (Retired), Greater Cincinnati Police Museum Researcher. All rights are reserved to them and the Greater Cincinnati Police Historical Society.